There are many ways in which both the painter and the scientist approach color. For the scientist, a rational model is constructed to categorize and describe it as a phenomena. At colorsystem.com there is an excellent presentation of the various scientific theories that have been created over time. 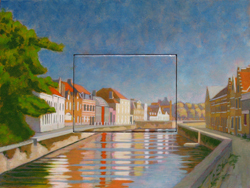 At rationalpainting.com I recently discovered an online community of realistic painters who apply the Munsell Color Theory in a very practical way to their working methods. Additional to scientific theories, artistic color theories tend to be more relational, more psychological, and ultimately more visceral. The theories of Josef Albers, in ‘The Interaction of Color’ and Johannes Itten, in ‘The Art of Color’ are two such 20th century examples. Another way to approach color involves viewing it from the standpoint of light itself, that is, additive and subtractive light. Notebook has an interesting resource page on the topic of Light and its qualities. Thus, while the painter’s craft necessarily exists in the world of subtractive light, by manipulating mediums and pigments to experientially stimulate thoughts, emotions and sensations, it derives – as does life itself – from the world of additive light. The primary colors for additive light are red, green and blue. Thus, if three different spotlights are focused together upon one location, and one light is covered with a filter of red, the second of green and the third blue, the location itself will reveal white light to the human eye. The technologies of television, computer screens and color separation in the printing industry are all based upon additive light theory or RGB (red, green, blue). The primary colors of subtractractive color theory are yellow, red, and blue. Every young child learns this in kindergarden. He/she learns quickly that yellow plus red makes orange, yellow plus blue makes green, red plus blue makes purple, and all three together create black (or a very mucky brown). I call this kindergarden primary color. A further refinement to subtractive color theory are the primary colors of the printing industry. Rather than the yellow, red and blue of kindergarten, the printing industry uses process yellow, magenta, cyan and black. 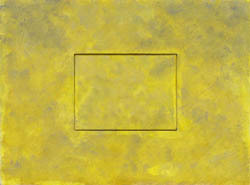 Process yellow actually contains the slightest bit of green in it – a cool, translucent, lemon yellow. Cyan is a translucent and dark turquoise kind of blue. While magenta is a cool, translucent ruby red, similar to the external fleshy covering of pomegranate seeds. These subtractive primaries, derived from additive light theory combine in different ways – principally through layering – to create the whole gamut of visual color that we experience in 99% of our printed material. If magazine green never comes from green ink, then why should an artist mix his or her colors so easily on the pallette? 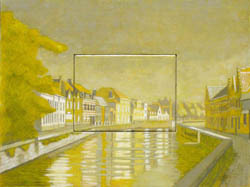 Similarly, a painter’s green created from superimposed layers of yellow and blue is qualitatively a different experience than that of a mixed green on the pallette. Since painting occurs in the world of reflective light, and subtractive color combinations are experientially clear, it’s also reasonable to ask, how much pallette mixing is truly necessary if the beauty of light itself is the goal? Any color we see in the natural world is always more beautiful in the degree to which it can transmit light. The ancient techniques for creating imagery are time tested procedures for isolating, cherishing and showcasing the spectral purity and luminosity of individual pigments. The medium of oil itself being particularly adept at transmitting light through layers.